Airline Captain, Mark L. Berry, is every bit of fabulous. His talents are many, but his perseverance to an aviation career, life, and love surpass no other. 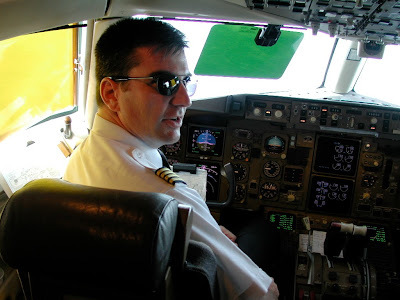 This story is not as much his journey from a passion for planes to an airline career. But more so... from one life to the next. 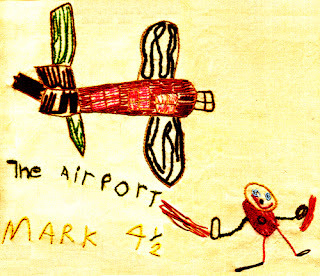 Mark and I connected through aviation. 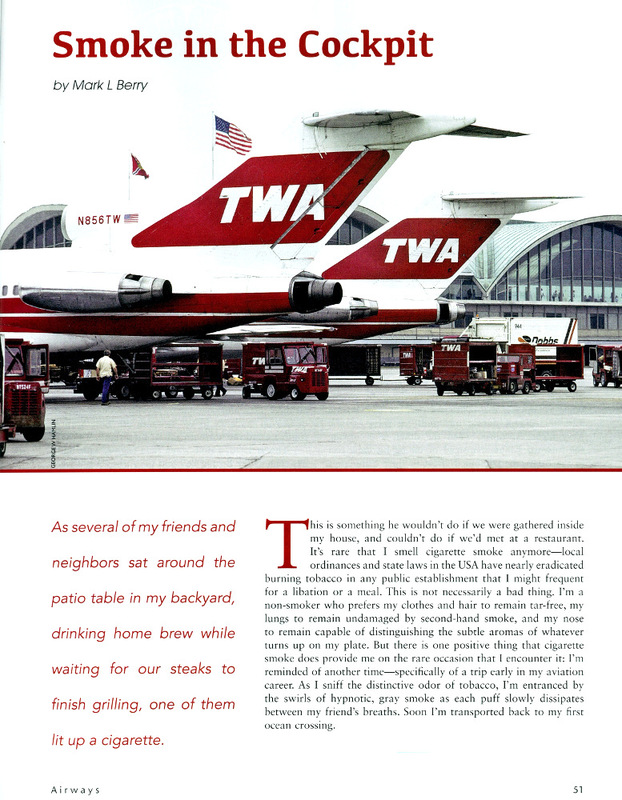 But shortly thereafter we learned how small the airline family is when we discovered that his life blew up in front of my plane on a fateful departure out of JFK... TWA800. Mark's journey is fascinating and one that you will want to share. Karlene: Mark, tell us how your flying career started. Mark: My flying affliction, or piloting passion, is a story familiar to most airline pilots. The bug bit me at an early age. 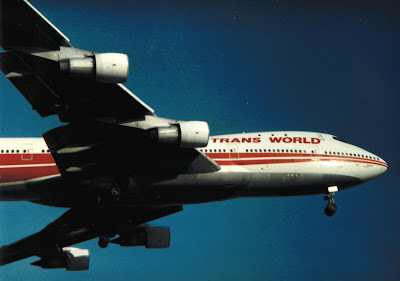 When my parents took me to JFK International Airport to board a National Airlines flight for a Florida vacation back in the 1960s, the aircraft swallowed me whole. Even though we disembarked in the Sunshine State for a short beach stay, traces of jet fuel would forever be found in my DNA. I eventually became the first pilot in my family—soloing two weeks before my dad. 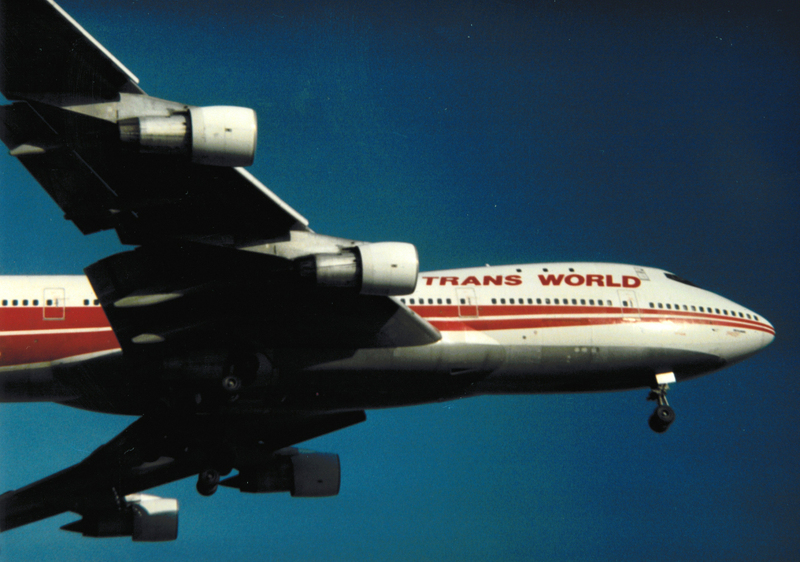 I simply fell in love with airplanes the first time I encountered one back when I was only a few years old. Karlene: It's amazing that your life started at JFK, and then you thought it ended there as well. But more about that later. Not only do you fly, but you write songs, books, and articles for numerous magazines. When did your writing journey begin? Mark: Uncovering my creative writing roots reveals the more painful story of my seventeen year journey that eventually led to my memoir 13,760 Feet—My Personal Hole in the Sky. Before TWA Flight 800 on July 17, 1996, my creative writing was limited to thank you notes and international postcards—my efforts to maintain distant friendships while following my compulsive wander lust. But when I finally settled down—found the woman of my dreams, began planning a family, and made the down-payment on our first house together—and all that was instantly ripped from my world by the deadly explosion of my fiancée Susanne’s ill-fated final flight, I plunged down an abysmally dark hole. Karlene: I cried when I read your memoir. This was the most beautiful story. Not only of you following your dream to become a pilot, but losing your love along the way and your journey of finding the strength to live again. I know that writing helped bring you to where you are today, but what were those early days like after losing Susanne? Mark: Living wills address brain-dead scenarios; in my case I became heart-dead. My brain remained fully functional, and my airline even tested it—forcing me to count backward from 100 by 7s, for example—but I began living without hope or ambition for the first time in my life. You could say that my house was swept away like Dorothy’s in The Wizard of Oz, and I was seeking a heart like the Tin Man. And like their adventure with Toto, the Cowardly Lion, and the Scarecrow, both of our journeys are filled with songs. But my life lacked a wizard, or a pair of ruby slippers, to send me to my desired destination. 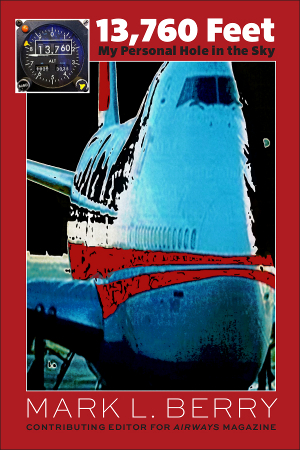 Mark: After some forced time off—my grieving airline initially couldn’t deal with the pilot who’d lost his fiancée on the flight where 38 crew and family members were lost—I was able to function in the cockpit and safely move widebody aircraft from one continent to another (the exact form of transportation that claimed Susanne’s life). For ten years I performed admirably—I even became an integral part of my airline’s training department—but my personal life and happiness was on perpetual autopilot. Karlene: What broke you free and pushed you forward? Mark: Ten years was a landmark, and my close childhood friend Warren, along with my dad, sat me down and challenged me to find a way to move on. They didn’t care how, that was up to me, but they emphasized that it hurt them to keep watching me live aimlessly even though outwardly I appeared functional and successful. I had to admit to them, and to myself, that I was stuck in survivor’s guilt and still wallowing in grief. Finally, during a workout at a Philadelphia airport-layover hotel, I drafted my first set of lyrics and attempted to write myself out of that emotional hole where I’d surrendered and sunk. I can still remember those words interrupting my weight training as they popped into my head. While chewing on the challenge of moving on, I tried to describe how hollow I felt. You can hear musician Kimi Lyn Smith sing "From a Long Way Away” in what became my first co-written song, and the spark that grew into my first novel Pushing Leaves Towards the Sun. “What? No way!” That was my consistent gut reply. 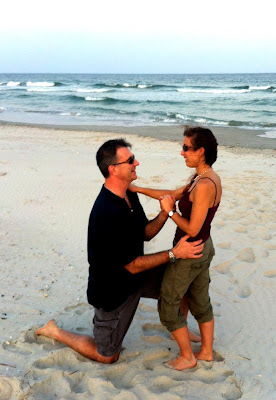 I didn’t want to tap directly into the darkness where I stored the memory of losing Susanne. “No, no, no,” I continually told them, but still that challenge lived on inside of me. Karlene: How did writing bring you back to your friends and family? Mark: Creative writing began to make me feel the way flying used to. I’d earned an Embry-Riddle undergraduate degree in aviation to launch my first passion, so I began considering formal literary training to further my short story and fiction pursuits. Nonfiction still wasn’t on my radar until I attended a preparatory class at a local university while applying to advanced degree programs. Karlene: As I read your story, I wondered how you found the courage to write about that fateful night. Mark: I have UMSL’s Professor Howard Schwartz to thank for assigning me to write about the night Susanne died, and for pushing me past my initial no, no, no response. That was my first foray into writing essays, and it also became my first published piece. A syndication of Connecticut newspapers announced, “13 Years Later, He Can Finally Tell His Story of TWA 800” with my name in the by line. It was Dr. Michael C. White who eventually convinced me to develop that essay into a memoir as he accepted me into Fairfield University’s creative writing MFA program. Of course, my friends and family had been trying to tell me that all along. 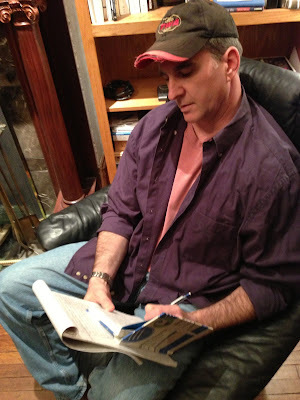 Mark: I finally embraced my soul-searching assignment, and began writing, work shopping, and polishing my unique commercial aviation experience as both an active pilot and a grieving family member. The entire effort was worthwhile doing for my own personal development, but of course every aspiring author also craves an audience. Any writer will tell you that finding that readership is a daunting task. I had the great fortune that Editor-in-Chief John Wegg at Airways magazine found my submission Pigship Probation (now Chapter 20 in my memoir) in his unsolicited-submission slush pile and took an interest in my work. Over the next three years more than a dozen chapters of my memoir found their way into Airways as articles, and reader feedback helped push me to continue developing what became over 300 pages of prose with 34 companion songs. Karlene: One of the unique things in your memoir are the songs you've included. How did the writing community accept this added creativity? Mark: The jury is still out whether the companion songs in my memoir poetically promote the prose, or serve as a distraction. While I try to remain open to feedback and constructive criticism, this is an area where publishing professionals mostly frowned. But the lyrics were such an integral part of how I was able to dig deep inside myself, I could never consider publishing my story without them. Karlene: I am glad you kept them in. The reader has the option to read beyond, or embrace the feeling in the prose. I did not find them distracting and it was a unique touch to your moving story. Karlene: The best part of your story was the ending. (Spoiler alert.) Through this journey you found love again. In your audiobook Pushing Leaves Towards the Sun I noticed one of the co-authors is Dr. Alison Leston, who is now a bit more to you. Mark: Alison is not just a collaborator and a friend; she is my new love to whom I have finally been able to open up. She lived only seven blocks away from me in St. Louis for about a dozen years, and yet we failed to connect until we were set up "for a quick midweek cocktail." But in some ways it was just as well because I wasn't ready for her until my creative writing soul search took me on a more intense life journey than any of the jets I have ever flown. Mark: While I was scouring the world to find myself, along with a faint hope of encountering someone special, she was right under my radar and inside my focal length until I was finally emotionally available again. I learned a painful and lonely lesson while writing my memoir: as much as I'd love to change the past, I can only change the future. Alison’s and my love is a story I am just now beginning to write--and it feels like a fantasy. There you have it... Anyone can have a happily ever after ending despite the horror that life can throw our way. Mark will show you how in his outstanding memoir. This is one story that must be added to your collection of really good writing. Inspiration, healing and laughter through a pilot's journey... Mark's memoir 13,760 Feet has it all. Thank you for your comment Andrew! And.... you will love the story. A pilot for the very airline that claimed his fiancée on Flight 800, Mark’s struggle with survivor’s guilt takes him down a rabbit hole more foreign to him than the exotic, worldwide destinations of his Boeing 727. Determined to bury himself in the work of his “aluminum parachute,” as he calls it, he is instead forced to face his own demons—and himself—as he claws his way back to inner peace. Harrowing, gripping, and full of life lessons for those who may have to struggle with the death of a loved one—that is, everyone—13,670 Feet is surprisingly entertaining as well. Thank you Eric. His is an amazing story for sure. And the best thing is it's a book that will actually help someone through the darkness of losing someone. Plus... he's an excellent writer too. Thank you for the great comment! Mark, you are a warrior and a hero. Karlene was mentioning you on the internet and I was expecting she would make a Friday Flyer about you. Fascinating story, I don't have words to make a decent comment. Thank you for sharing all this. It's valuable. PS: You wrote Karlene's Flight For Control review on Airways Magazine, right? It came to me in Brazil, and I liked it a lot! You chose the right words. Alex, Thank you so much for the great comment! Yes... he Mark is an excellent author. I like his words too. :) You will love his story. I think your mum might cry. But it has such a happy ending. We all love happy endings! Reading "13,760 Feet" now. Very moving. I vote that the lyrics were a unique feature that added to the work. Not a distraction at all. Thanks Bill! I'm glad you're enjoying the book and the lyrics too. He's a great writer and the story is so touching. We see accidents happen, but until you have someone you know or are connected...they are an accident of a machine, and not souls. But he reminds us that there are loved ones on these planes that we must guard with our lives. Wow. What a story of both tragedy and triumph. It goes to show how time really does help, even though it may be a little more than we would like. Thank you so much for the wonderful comment. Tragedy to triumph ... we always need to hold on for one more day.